GearBest is celebrating its 4th anniversary by kicking out numerous amazing products with discounts so big you’d think it was Black Friday: massive coupons, exciting flash sale, free gifts, a fun lucky draw — and so much more! That’s a hard-won chance! Do grab it to save a fortune on your favorite items. GearBest 4th anniversary promotion will begin on March 20 and end on April 9. The whole party is divided into three stages: Party Countdown, Your Unbeatable Prices, GearBest Gives Thanks. Note: All time displayed below are UTC time. Join the preheat activity and get ready for your super saving shopping. Do steal a march on others to seize the first bonus wave: News Ticker bestsellers, lightning flash sales, surprising lucky bags, site-wide mega coupons, exciting lucky draw, cool add-ons, and long-time members exclusive coupons. You don’t have to wait any longer. The anniversary will formally start at 2:00 am, Mar 26. 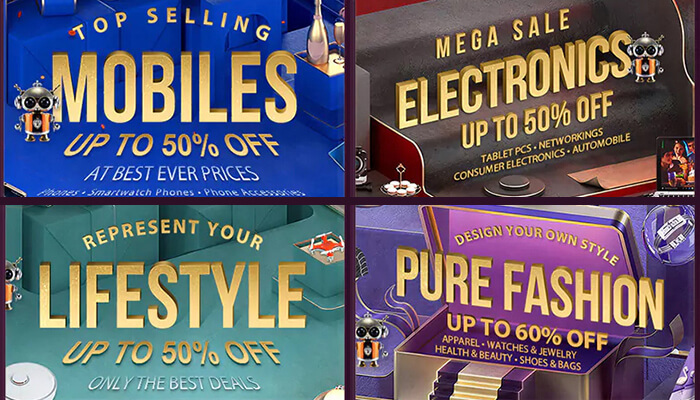 Just sit in front of a computer and keep your eyes wide open to snap up limited coupons, hunt the flash sale items at unbeatable prices, seckill the top sellers, play the Easter Egg game to win Chuwi Hi 8 Air Tablet PC, and so on. The anniversary will end with the prime time thanksgiving. Don’t overlook the after-party encore, as the surprise is always the last one to come, especially when I tell you, in a whisper, there is the top deals zone with deals from just $0.99. To score some crazy bargains, first get acquainted with our recommended shopping strategies. GearBest will launch 2 waves of flash sale at 2:00 UTC and 9:00 UTC every day. All the flash sale items are in limited stock and at the lowest prices. Do remember the flash sale time and catch your favorite items at the best prices. To show great thanks to our long-time members, GearBest will give away different vouchers according to your membership level. For the established customers (registered in 2016), if your total orders are over $120, you will get $10-worth of vouchers. For recent customers (registered in 2017), if your total orders are over $300, you will get $25-worth of vouchers. Note: All the vouchers above are applicable to all products on GearBest except for flash sale products, App exclusive and email-only offers. The vouchers will be limitedly offered at 9:00 UTC daily. For any order over $100, you can get 1 add-on item for just $8.44. Note: you can only get 1 unit for per add-on item each time. And if your orders are qualified, the discounts of the add-on items will be automatically applied to your shopping cart before checkout. Feel tired? Unwind with a Lucky Draw game! You have 3 free chances to try your luck. To get more chances, you can share the game link or spend your GB Points (20 GB Points will earn you one draw chance). The total draw chance cannot go over 5 times. $20 off coupon for the orders over $200. The above coupons are applicable to all the products on GearBest except for “Flash Sale”, “App Exclusive” and “E-mail Only” items. On top of the above universal activities, we also hold special promotions for the 4 main categories: Mobile Phones, Electronics, Lifestyle, and Fashion. All the products you need are here and all the prices have been slashed to ribbons. Just hang out in each plaza and enjoy the ridiculous discounts. With the excellent quality and terrific prices, you are sure to walk away with a few steals! You can also check this page to know more shopping strategies about GearBest 4th anniversary. There has never been a better time to hunt for super deals than this 4th anniversary promotion. But you’d better hurry! My beloved VIPs, our party feast is ready — so dig in!